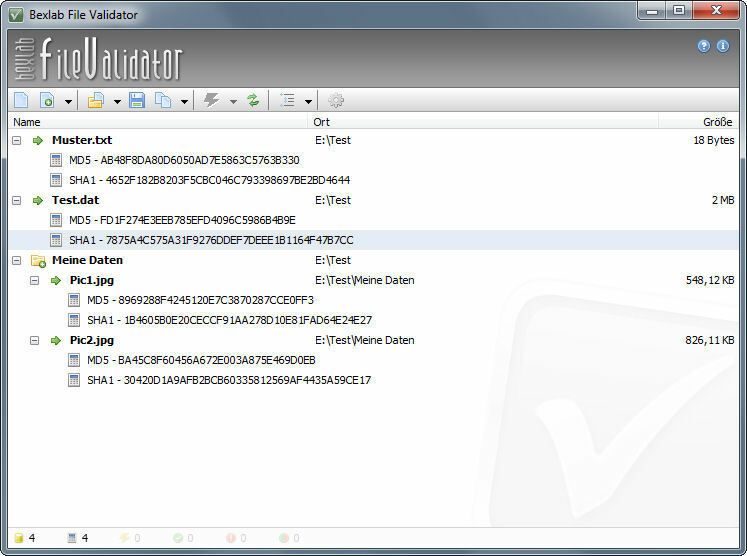 Bexlab File Validator is an easy-to-use program to prepare and compare checksum. It is usually desirable that copies or files from the Internet match the original data, especially for backups or large files. 1) Many test methods: CRC-32, HAVAL-128, HAVAL-160, HAVAL-192, HAVAL-224, HAVAL-256, MD2, MD4, MD5, PANAMA, RIPEMD-128, RIPEMD-160, RIPEMD-256, RIPEMD -320, SAPPHIRE, SHA1, SHA2-256, SHA2-384, SHA2-512, SNEFRU-128, SNEFRU-256, SQUARE, TIGER, WHIRLPOOL, WHIRLPOOL1. 2) With the Bexlab File Validator you can check simple files or folders (including subfolders). 3) If you add a folder and only want to calculate the checksums of exe files, you can do that by using the filter function. 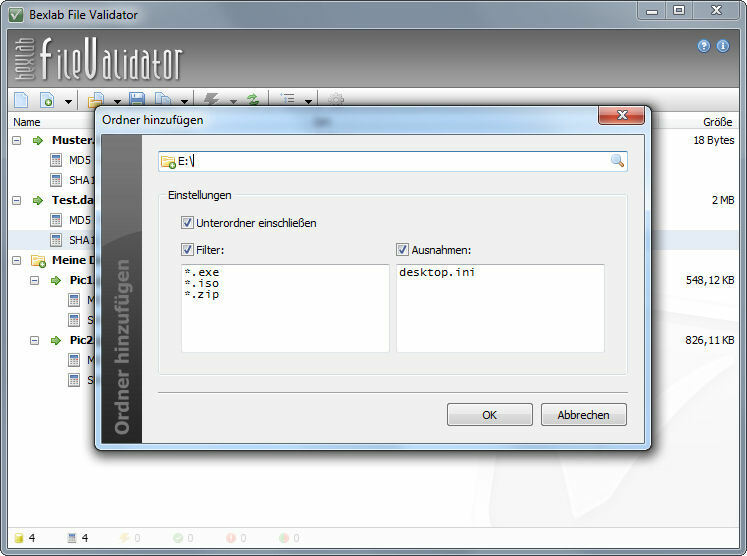 Exclusions can also be defined as files or folders. 4) In addition to the normal addition from the toolbar, it also supports drag and drop, so you can easily load files and folders from, for example, Windows Explorer on the list. 5) The calculated checksum can be saved as text (CSV), XML or in the program's own file format (BFVF). BFVF files are required for automatic validation. 6) The check numbers can also be copied directly to the clipboard. Here, simple text and formatted text (CSV) are supported. 7) For quick comparison of individual checksum, you can use manual checksum comparison. The snippets can be added manually or inserted via clipboard. 8) For quick comparison of many checksums, the automatic checksum comparison can be used. 9) Files from directories or entire discs can be checked with a single click. Find Bexlab File Validator (Light Edition), mark it and choose "Uninstall"
Should Bexlab File Validator (Light Edition) has been damaged or corrupted and thereby difficult to remove we can recommend you finding help to uninstall it here.